Robert Murphy and his brother John established J & R Murphy, which made dental and surgical instruments, in 1850 in Boston, Massachusetts. Then in 1862 the brothers moved to Mansfield, Mass,. where they bought, at mortgage sale, a two-story building for $6,300. The sale also included a little shop, a two-story house, and all current water privileges on the Rumford River. 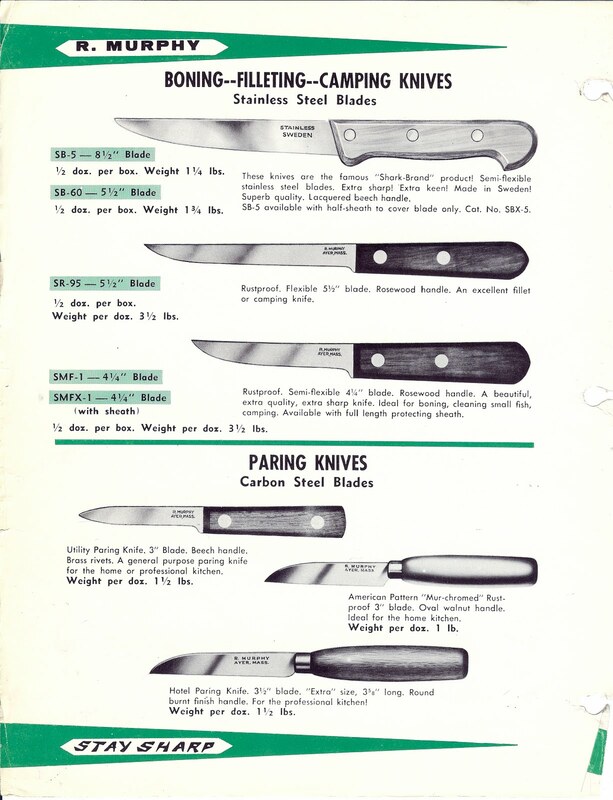 With this purchase they were able to expand their line, adding a great variety of fine cutlery, including oyster knives, shoe knives, paperhangers' knives, cigar knives, pruning shears, buttonhole cutters, tobacco shears, pinking irons, butter tryers, cheese tryers, can openers, cork screws, cigar box openers, and skates. They imported their steel from England and employed skilled craftsmen from there as well as from Germany, Europe's top two leaders in producing quality cutlery, to work with the local craftsmen in their shop. John settled in Mansfield, but Robert returned to Boston in 1877 and carried on his cutlery business. Then in 1884, Robert bought the Oregon Mill in Harvard, Mass. and "began preparations for the manufacture of cutlery here." Around 1906, he and his sons, who were by all accounts working with him by then, moved the business to Ayer, the neighboring town, where it is still in business today. The 1908 catalog lists John R. Murphy and W. Edward Murphy, his sons, above the company name (presumably Robert had retired), which had been changed to Robert Murphy & Sons. 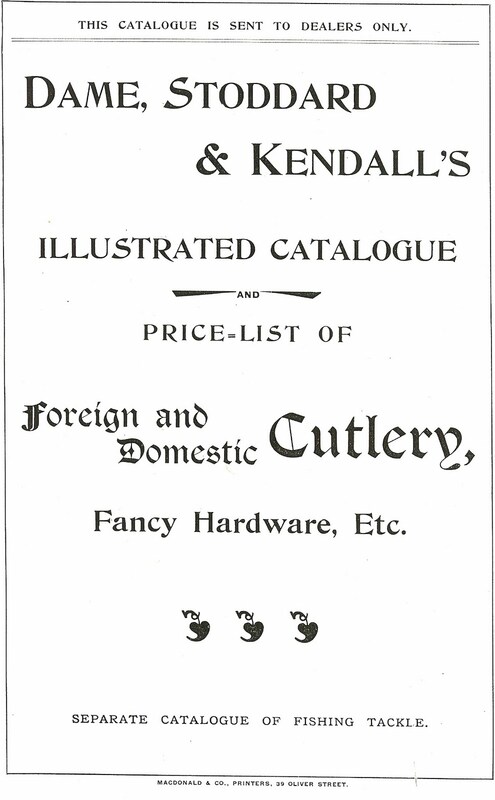 By this time, and in their new location, John and Edward were again able to considerably expand their line of cutlery, adding rubber knives, lemon knives, chiropodists' lances, bandage knives, eel-spears, thread knives, furriers' knives, carpet knives, sloyd knives, feather curling knives, banana knives, shirt, collar and cuff blades, burnishing irons, and wood turners' parting and sizing tools. 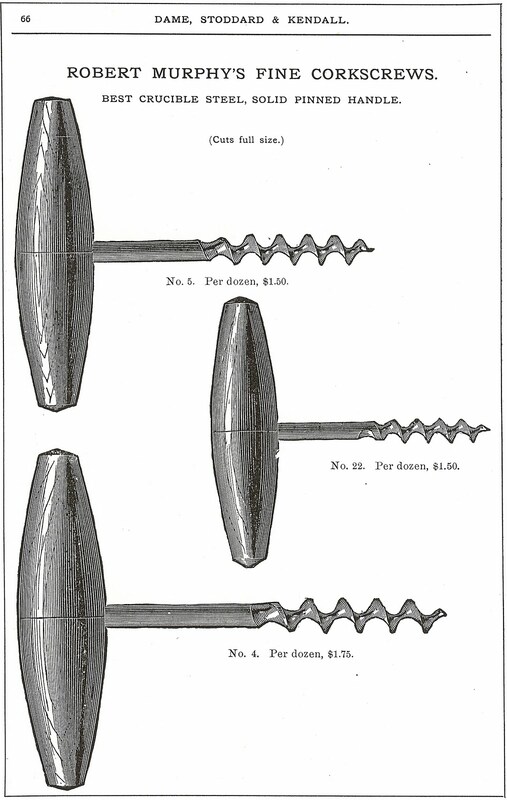 These products and many more, including the corkscrew that John Murphy, the son, had patented in April 1901, were sold through their own catalog as well as the catalog of Dame, Stoddard & Kendall. At that time, Dame, Stoddard & Kendall was a large importer (among the largest in America) and agent for many leading American manufacturers, including Murphy, and some of the best houses in Europe. 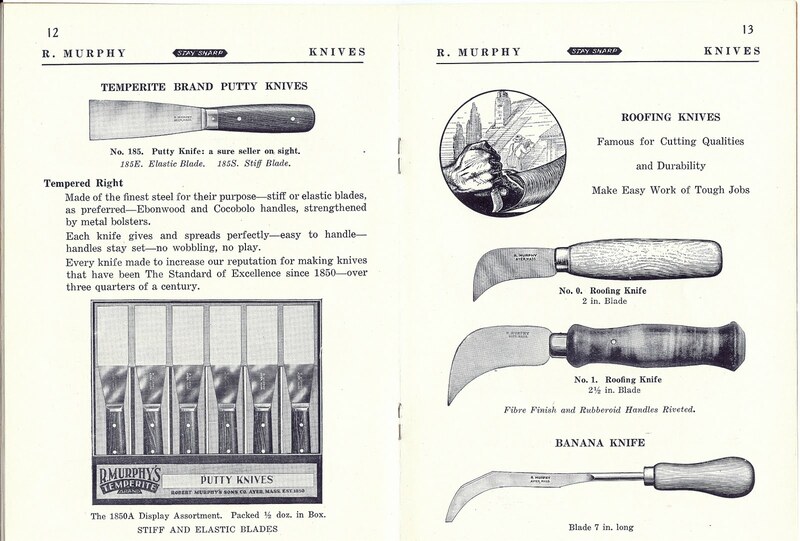 "Robert Murphy's 'Celebrated' Steel Goods" or "Robert Murphy's Fine Corkscrews" headline each of the fifteen pages featuring Murphy products in their catalog. This firm, established in 1800 and located at 374 Washington Street in Boston, was considered "first in rank." 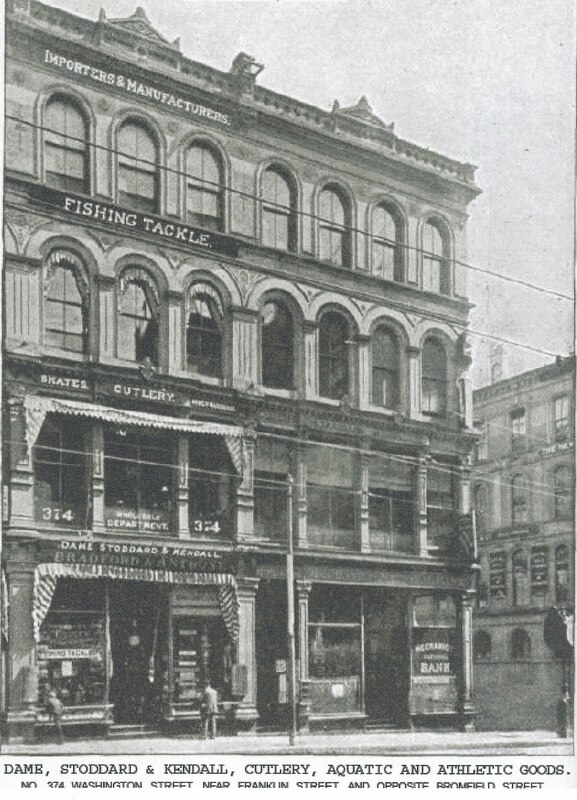 They carried an unsurpassed stock of cutlery, fine and fancy hardware, fishing tackle, anglers' apparatus, leather goods, athletic goods, and kindred wares all under one roof -- selling to retailers and wholesalers throughout the whole country. Still in business today the well-known, highly regarded Stoddard's Cutlery recently relocated to Watertown St. in Newton, Mass. from the Chestnut Hill Mall where they had been since moving from downtown Boston. 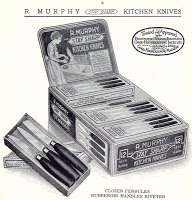 In 1913, John and Edward incorporated the company under the name Robert Murphy's Sons Co. By 1925 they had again expanded their line to include, among other products, kitchen knives sold in sets of one dozen, which came in handsome display boxes picturing the woman of the house at the stove peeling potatoes. 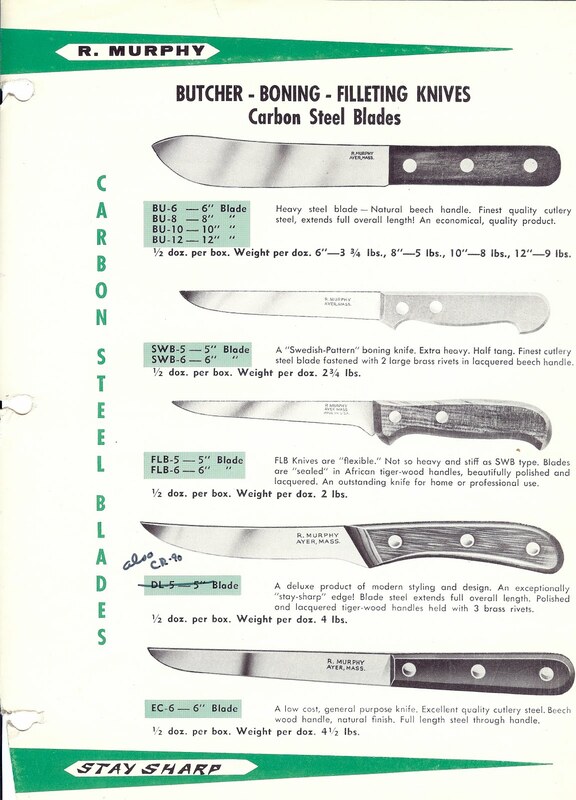 The handles of these knives were advertised as "waterproof rubberoid finish and securely riveted to the blades." At this time they coined their logo, STAY SHARP. By 1934 they had trademarked the STAY SHARP logo with the diamond in the center and the name R. Murphy Knives: MADE SHARP and STAY SHARP. 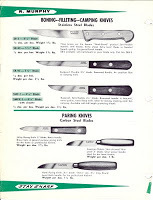 They had also added some new products, including carton and corrugated board knives, display cut-out knives, grapefruit knives, manual training knives, paring knives, oil cloth knives, pattern makers' handles, plaster knives, putty knives, roofing knives, stencil blades and handles, and wood block knives. At this point they were producing a line advertised as "TEMPERITE" Brand and also advertising kitchen and grapefruit knives in stainless steel. 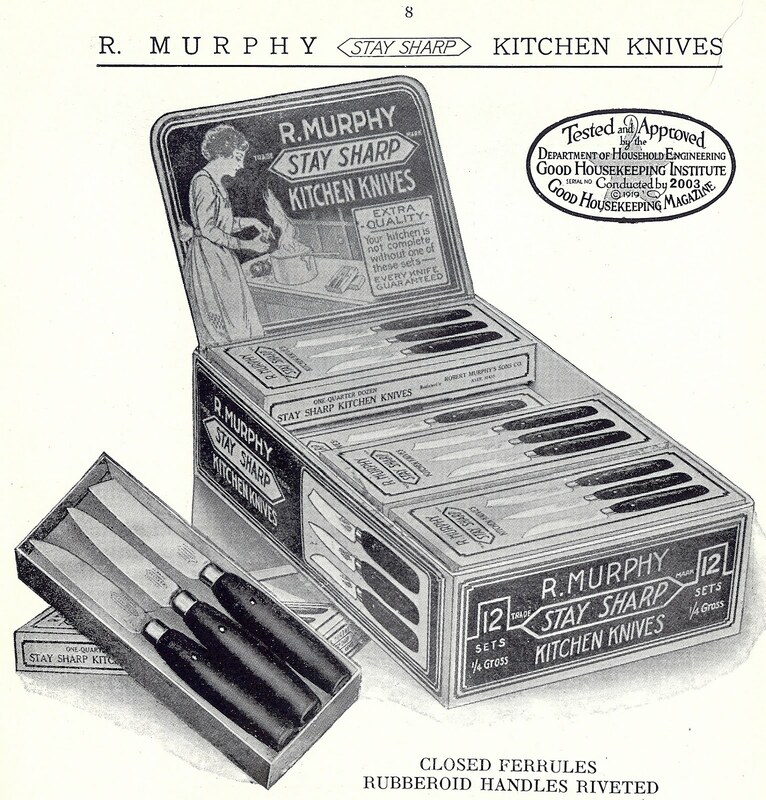 Murphy continued through the years in this fashion, successfully adding to their product line (butcher knives, filleting knives, and sportsman's knives, to name a few), advertising and selling their fine cutlery products on into the 1940s and '50s under the guidance of the Murphy sons, John and Edward. When John died, Edward ran the business and when he died, his wife tried to keep it going with the help of the foreman. However, after about six months she sold the business to Mr. William Maxant, in 1954, who kept the Murphy name, changing it to R. Murphy Company, Inc. William Maxant and his wife, Helen, enjoyed their successful knife business for fifteen years and then sold it to the Bethke family, owners of the Concord Oil Co. of Mass. in 1969. Ted Maxant, son of William and Helen, owns Maxant Industries, a manufacturer of bee keeping supplies and honey processing equipment. It is also located in Ayer. Douglas A. Bethke ran R. Murphy Knife for the family, in addition to racing cars on the Sports Car Club of America circuit. 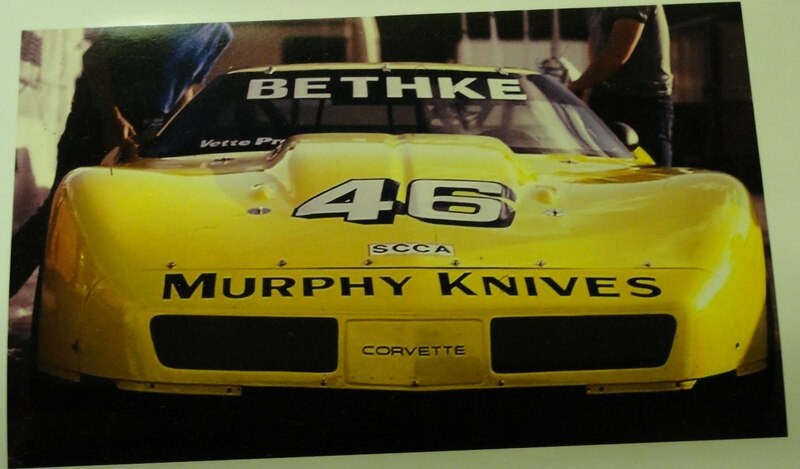 He and his Corvette emblazoned with "Murphy Knives" on the hood competed and won many races in the 1980s. In 1982 he raced and beat Paul Newman in Atlanta. In 2009 when Doug retired, he sold the business to it's current owners -- just the fourth owner for Murphy in it's 160 years -- Mark Furman and Mimi Younkins of Framingham, Mass. Mr. Furman, having owned and operated ManageWorks, a construction management and consulting firm, decided to apply his engineering and business background to a new pursuit. Murphy, with its long, rich local history and quality line of products made right here in Massachusetts appealed to them. 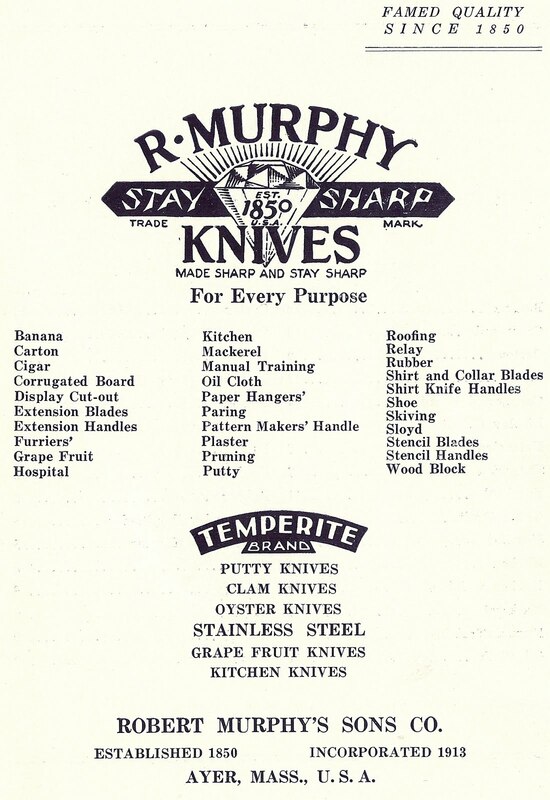 They bought R. Murphy Co., Inc in May of 2009 and enthusiastically maintain the high standards of quality knife production set so long ago by John and Robert Murphy, trademarked by sons John and Edward Murphy, and carried on by the Maxant and Bethke families. MADE SHARP and STAY SHARP.